CP-501B is designed for wire (UTP/STP) or wire and multiconductor cable of Ø 3.2-9 mm. Also strips irregular out-shape insulation: just put the cable into the front “V” and “U” guide and rotate the tool 1-3 times by your index finger for stripping the outer insulations easily. 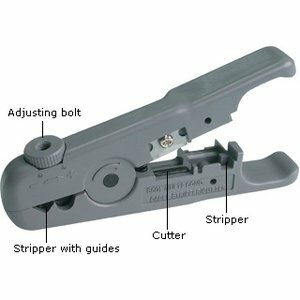 CP-501B is the same as 6PK-501: the only difference is the additional adjustable knob for slitting cable of various sizes.